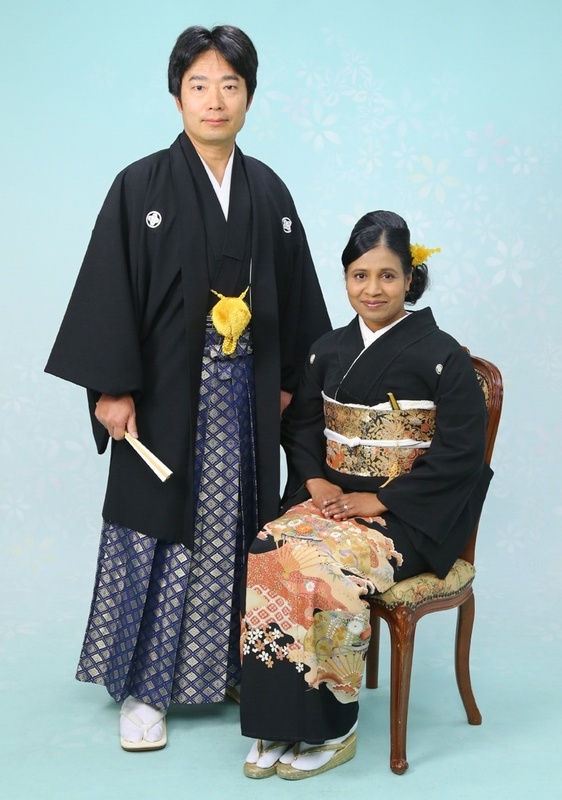 As I wrote in the previous post, hubby and I visited Toyama Castle in the morning of 29th December 2014. Later in the afternoon we visited Shirakawa-go. Shirakawa-go is a historic village located in Shogawa River valley at the foot of Mount Hakusan in the northwestern part of Gifu prefecture, and is located next to another historic village named Gokayama in Toyama prefecture. In fact, these villages are typical mountain villages that are surrounded by remote mountains and forests, and stretch across the border of Gifu and Toyama prefectures. Shirakawa-go and the neighboring Gokayama villages were declared as UNESCO world heritage site in 1995. These villages are famous for their traditional Gassho-zukuri architectural style farmhouses, some of which are more than 250 years old. Gassho-zukuri architectural style means ‘constructed like hands in prayer’, as the farmhouses are characterized by thatched and steeply slanting roofs resembling two hands joined or pressed in prayer. This architectural style of the roofs developed over many generations and the design is exceptionally strong. This design in combination with the unique properties of the traditional thatching, allows the houses to withstand and shed the large amounts of heavy snow that falls in the region during winter. In addition, the roofs, made without nails, provided a large attic space used for cultivating silkworms. Shirakawa-go is widely known as one of the most scenic places in Japan. The picturesque village feels like an old fairy tale world hidden away deep in the mountains. The largest village and the main attraction of Shirakawa-go is Ogimachi. In fact, Ogimachi is the most popular village for the visitors. The quaint settlement offers visitors the opportunity to experience the harmony between the village and nature. 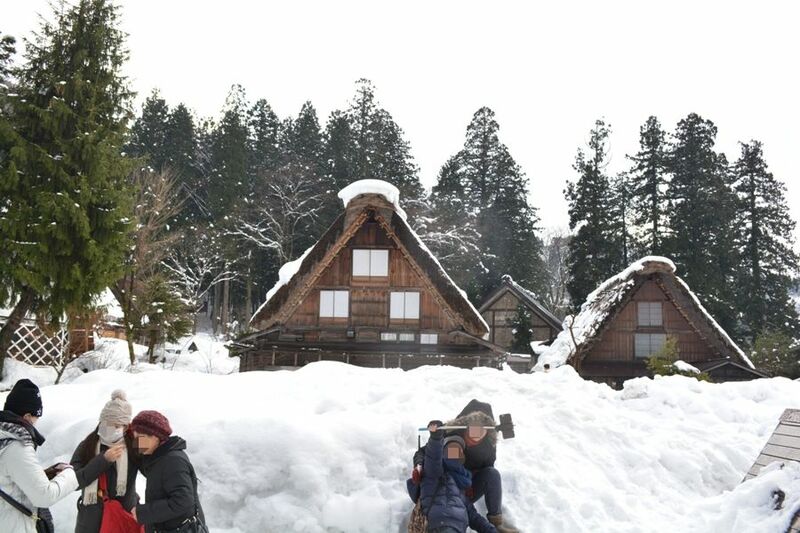 Ogimachi village is surrounded by pine tree-covered remote mountains. The village has many rice fields and Shokawa River runs through it. Besides the beautiful scenery of Ogimachi, the unique thatched-roof farmhouses are the center of attraction of the village. 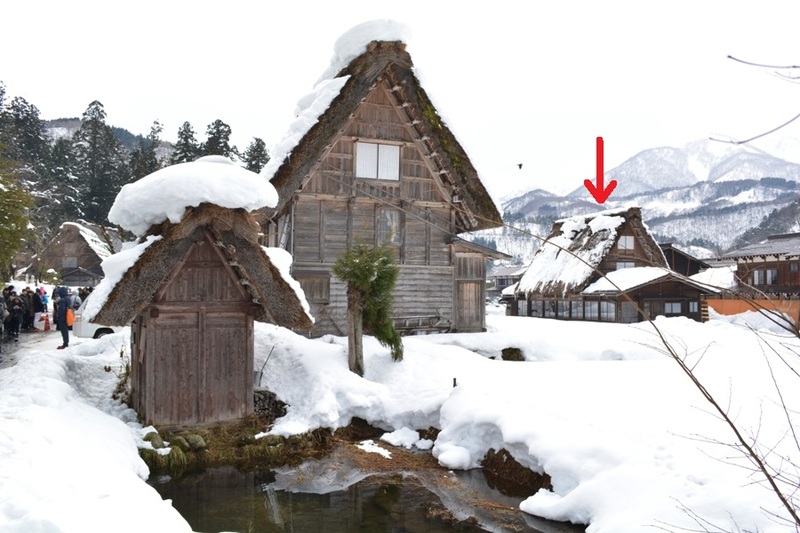 The village has 114 Gassho-zukuri styled thatched-roof Minka farmhouses that remain from historic times. Most of these farmhouses along with sheds and barns were built about 200-300 years ago, and remind us of ancient Japan. Many of these houses are still inhabited to this day, and together with their adjacent rice fields, they paint an incredibly picturesque landscape that is a joy to behold and to take a stroll through. The best way to experience the village is to stay overnight at one of the farmhouses, many of which now serve as Minshuku inn. 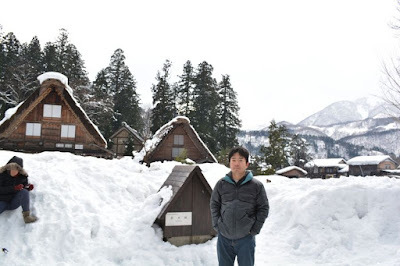 Hubby and I visited Ogimachi village of Shirakawa-go on 29th December 2014. We went there by our car. As we neared Shirakawa-go, we saw snow covered mountains all around us. In fact there was huge amount of snow everywhere as it was mid-winter season. First we went to Michi no Eki Travelers’ Plaza located few kilometers away from Ogimachi village. The plaza has Gassho Museum where visitors can learn about how the Gassho-zukuri houses are made. In addition, the plaza has an information center as well as local specialty and souvenirs. Unfortunately the plaza was closed due to the year-end holidays. But we liked the building architecture and took rest for some time before proceeding further on our way to Ogimachi village. Although Ogimachi village of Shirakawa-go is just 4 kilometers south of Michi no Eki Travelers’ Plaza, it took us almost 1.5 hours to reach the car parking lot of Ogimachi. This is because of severe traffic jam due to the New Year Holidays. Near the car parking lot of Ogimachi, we saw many snow covered Gassho-zukuri farmhouses with steeply slanting thatched roofs. Most of these farmhouses now serve as souvenir shops or restaurants. 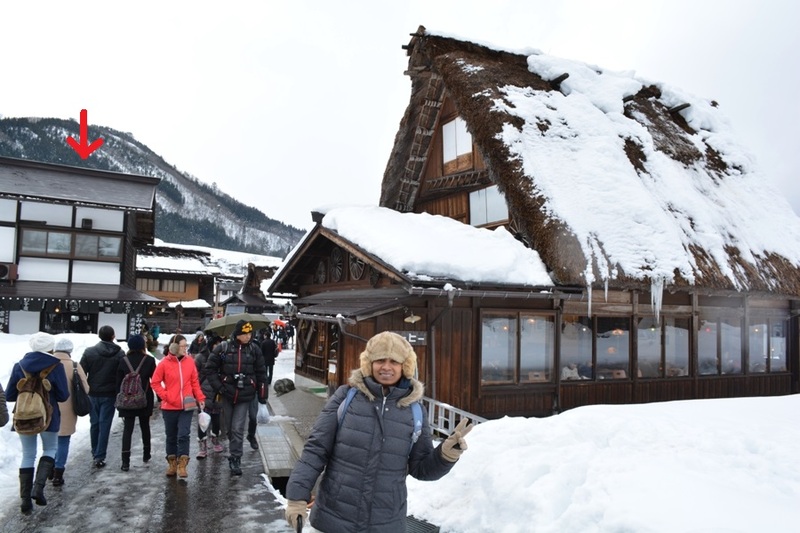 We felt that Ogimachi warmly welcomed us with the wonderful sight of such unique buildings in extremely cold weather. Next we walked leisurely over a pedestrian suspension bridge named Deai-bashi located across Shokawa River, and enjoyed viewing the snow covered surroundings from the bridge. Just after crossing the bridge, we saw a stone Torii Gate of a shrine named Akiba Jinja Shrine. We passed through the gate, and started walking along a road with Gassho-zukuri styled farmhouses scattered on either side of the road. To our right side along the road, towards the south, we saw a Gassho-style private residence and a Minshuku inn named Yoshiro. It is a homely inn for a relaxed stay and has Irori hearth for cooking as well as staying warm. To our left side along the road, towards the north, we saw several more uniquely styled buildings, like a private farmhouse residence, Binen Yumeromu Museum far in the background, and a Minshuku inn named Rihee. Binen Yumeromu Museum is 130 years old and its Gassho-style roof was renovated in 2010 after 40 years. The museum exhibits the paintings and wood carvings created by a local artist named Itadani Mineshi. We did not visit the museum this time. Rihee Minshuku inn is 400 years old and has Tsumairi Gassho-zukuri architectural style. We loved the roof of the shed located in front of Rihee Minshuku. We continued walking along the road towards the east, and next saw a rather new building named Ebisuya to our right side towards the south. Ebisuya is a famous souvenir shop which has Shirakawa-go related specialty products, like Hida folk art, local Sake, confectionary, and pickles stocked inside. We bought two cute wooden owls as souvenir from this shop. After several more meters of walking we saw a Gassho-zukuri styled grand looking farmhouse named Bunka Kissa Kyoshu to our left side towards the north. The farmhouse Kyoshu now serves as a cafe restaurant. I am standing next to Bunka Kissa Kyoshu. Ebisuya building is seen on the left side (red arrow). In this photo, both the buildings are viewed from the east. We walked further east along the road for another 50 meters or so and reached a spot where large amount snow was piled up to our left side. We climbed up the 4 meters high piled up snow and enjoyed the beautiful views all around us for some time. We saw two elegant Gassho-zukuri farmhouses to our left side towards the north. One of them is a private residence and the other one now serves as a souvenir shop named Yamaai no Ie stocked with handmade crafts, Hida folk art, and local Sake. We strolled towards the backside of the private residence and saw a small shed and a tiny pond in the backyard of the farmhouse. The snow covered steeply slanting thatched roof of the farmhouse, the shed, and the pond made for an incredibly picturesque landscape that was a beautiful sight to behold. We took several photos of the two buildings from various positions and angles. Snow covered backyard of the private residence farmhouse, a small shed, and a tiny pond made for a picturesque landscape. The Gassho-zukuri styled farmhouse to the right side (red arrow) is the backside of Bunka Kissa Kyoshu. Standing on the piled up snow, as discussed in the previous paragraph, we saw three Gassho-zukuri styled farmhouses standing elegantly in a row towards the east-southeast direction. All these farmhouse buildings looked so exotic in more than 2 meters of snow all around. These farmhouses now serve as Minshuku inn. The inn located farthest to us is named Hisamatsu which was built during the Edo period. It has 4 traditional Japanese-style guest rooms from where the guests can enjoy the view of the mountain and the village. The inn located in the middle is named Furusato. And the inn located nearest to us is named Kidoya that has 5 traditional Japanese-style guest rooms. 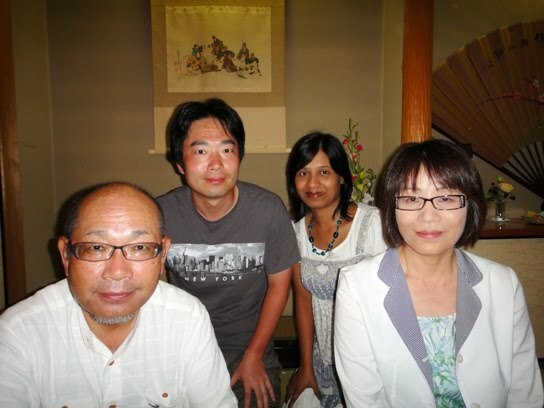 All these inns have Irori hearth and homemade Japanese-style cuisine is served to the guests. 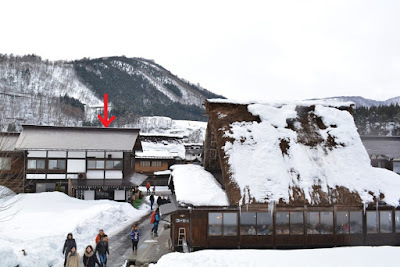 Standing on the piled up snow, we saw Myozenji Kyodokan Local Museum located towards the east. The museum consists of many elegant structures of Myozenji Temple, like Shoromon Gate, Hondo Main Hall, Kuri priests’ quarters, and a yew tree. Myozenji Temple is an offshoot of Jodo Shinshu Otani Sect and was founded in 1748. We wished to have a closer look at the building structures, and so we visited the temple premises. Myozenji Temple is famous for its unusual belfry-gate or the Shoromon Gate. The gate is two storied and the roof is thatched. The first floor has eaves and a bell hangs from the top of the second floor. The gate was constructed by a person named Kato Sadashichi in 1801 and about 1425 people worked to make the gate structure. The original bell was surrendered to the government during World War II, and the present bell was cast by a person named Nakamura Yoshikazu of Takaoka City in Toyama prefecture. After appreciating the gate structure, we walked past it, and saw the Hondo Main Hall of the temple right in front of us. Hondo Main Hall is unique and probably the only one in Japan having Gassho-zukuri styled thatched roof rather than the typical tiled roof seen in most temple buildings. Construction of the main hall began in 1806 when many zelcova trees were cut down for the wood to be used as construction material. It is said that the construction of the hall took about 20 years and was finally completed in 1827. The master carpenter, Mizuma Usuke, was aided by 9191 workers to build the hall. We noted that the thatched roof of the main hall was completely covered in snow and it was such a picturesque sight. I went inside the hall and prayed for the well being of my family. While going out of the temple premises, I saw a fresh green tree with snow all around it near Shoromon Gate. After the completion of the construction of Hondo Main Hall in 1827, vice-master carpenter Yoshiro planted this yew tree sapling as a memorial tree next to Shoromon Gate. The old tree brings harmony to the temple premises and is designated as a natural monument of Gifu prefecture. We came out of the temple premises and started walking along the road towards the north side. While walking, we saw a huge exotic Gassho-zukuri styled thatched-roof farmhouse named Kuri of the temple complex located adjacent to Hondo Main Hall. Kuri is the living quarters of the priests, and is connected to the main hall for easy access by the priests. Kuri was built during Edo period in 1817 by the vice-master carpenter Yoshiro. The upper floor of Kuri is open to the public where a lot of important resources and materials like tools of the local people and temple related materials are displayed. Kuri is designated as a cultural property of Japan. We did not enter inside Kuri but appreciated the exterior architecture of the building. We continued walking along the road and saw many more interesting Gassho-zukuri styled farmhouses and stunning snow covered views all around us. I will write about the other buildings that we saw in Ogimachi village of Shirakawa-go in the next post. Lovely peep into the snow covered village. 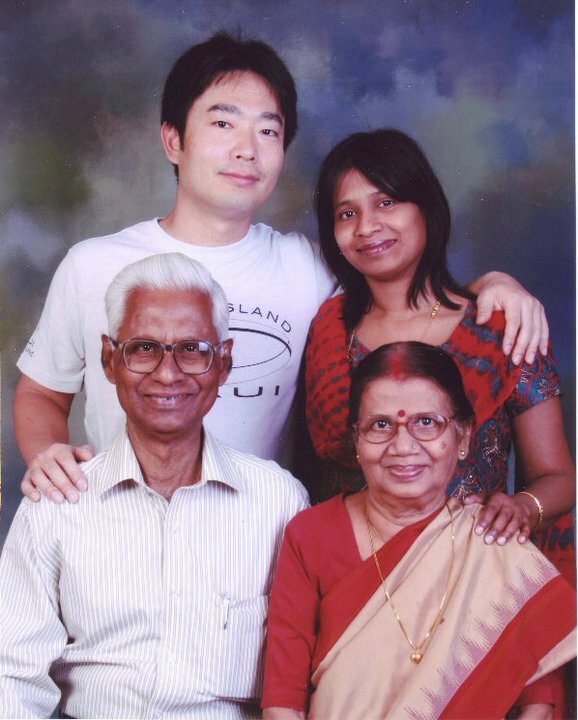 Hi, I recently finished reading 'The Lady and the Monk' by Pico Iyer, and was so fascinated by Japan, that I was randomly googling and stumbled upon your blog. Thoroughly enjoyed your posts! Hope to visit Japan someday! Thank you very much for your comment Kokila Gupta. The place we stay also has a lot of snow (probably more than Shirakawa-go) during winter but there are no Gassho-styled farmhouses here. It is always nice to see world heritage sites. Thank you very much for the comment Somali Chakrabarti. Thanks for the comment Savitha. Yes, Japan is fascinating and a fabulous place to live :). Please do visit Japan, you will love the place and the people.